In my previous posting on this topic I focused on determining Oracle Database cache buffer chain (CBC) wait time acquisition patterns; disperse or singular. A disperse pattern occurs when many CBC latches are active. In contrast, there are situations when only one or a few CBC child latches are extremely active, hence the singular pattern. In my previous posting, I also listed some disperse pattern solutions. 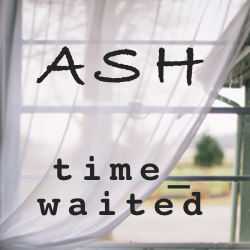 In this posting I'm focusing on the additional diagnostic steps needed before a specific solution can be determined with a singular wait acquisition pattern. Important: To understand what I write below you need a basic understanding of Oracle buffer cache internals. In particular the buffer, latch, child latch, cache buffer chain, and buffer header. These are described (including nice diagrams) in my posting here. In that posting a visualization tool is also used which you can download for free here. First, when a single block contains some application reference information and is not being changed often. The popular buffer causes its hash/cache buffer chain to be popular and then also the CBC child latch covering the hash buffer chain. If concurrency is high enough, this can become an issue. However, if the buffer is being changed often, we'd likely see a buffer busy wait. Second, relates to a popular index root block. Any time an index is accessed its single root block must first also be accessed, which repeatedly forces the question, "Is this index root block in the buffer cache?". If the concurrency becomes high enough, eventually you'll see CBC latch contention associated with a single CBC child latch. There are other singular CBC access situations. Next I'll present how to determine the acquisition pattern. We need to determine if the CBC child latch access pattern is disperse or singular. A way to do this is shown the SQL below, which is essentially my latchchild.sql OSM script. The script collects access details for latch number 150 (the CBC latch) over a 300 second period. Run the script a few times (i.e., collect a few sample sets) to ensure what you think is occurring actually is occurring. Figure 1 shows three CBC child latches received a high proportional amount of activity, especially the 76DAF26C child latch. Therefore, we'll focus on the three child latches with addresses 76DAF26C, 76DF508, and 76D38668. HLADDR is the "hash latch address" hence the column name hladdr. This is a foreign key to the v$latch_children view's addr column. FILE# is the buffer header's (also Oracle block and buffer) file number that links to many performance views and tables, such as dba_data_files.file_id and dba_segments.header_file. DBABLK is the buffer header's (also Oracle block and buffer) block number which may be referenced in dba_segments.header_block. TCH is the buffer header's touch count number, which is a popularity indicator...with a few twists I'll detail below. In every Oracle release I have checked (including 11.2), the tch column is not in v$bh, only x$bh. Keep in mind that each child latch will normally "cover" multiple cache buffer chains (perhaps >100) and each chain can have zero or more associated buffer headers (average chain length is usually 0 to 1). And of course each buffer header is related to a cached Oracle block residing in the buffer cache. In the report shown in Figure 1, we saw which CBC child latches are relatively busy; 76DAF26C, 76DF508, and 76D38668. Now we need to know which CBC chains and buffers are related to our relatively active CBC child latches. By querying x$bh we can easily determine the buffer headers associated with a given CBC child latch. We can also get a clue as to the buffer header's popularity. 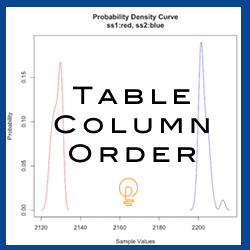 The SQL below is once such query. As I wrote many years ago in my touch count algorithm paper and detailed in my Oracle Performance Firefighting book, Oracle uses the "touch count" algorithm to essentially tag popular buffers. There is a little twist though... a buffer's touch count can get reset to zero. So to truly determine the popular buffers, we must repeatedly sample x$bh. The SQL below can be used to repeatedly sample x$bh finding the most popular buffers given their CBC latch address. If you look closely at the SQL, you'll notice it collects and stores 300, 1 second interval x$bh samples. If you use a larger sleep time, you'll want to increase the number of samples collected. The final select statement reports the key tch based popularity statistics. The statistics that I'm most interested in are the median (MED) and the maximum (MAX). And I'm hoping there is a clear buffer header or very few buffer headers that are relatively really, really active (i.e., hot). As a side note, you may have noticed that one of the COUNTS is 600 while the others are 300. This could have occurred because there are two buffer headers related to buffer 1,117329. Perhaps one could be the current mode (CU) buffer and the other a consistent read (CR) buffer. The above SQL could hbe improved by adding the state column to more uniquely identify a buffer header by its file#, block#, and state...but I digress. Based on the above SQL output, we know the hot buffers (file#, block#) are: (1,117328) and (4,1552339). You could also argue to include 1,117329 but this buffer header is not consistently hot because its median is much lower than the other two. But in all honestly, if this was a real production system and because the above SQL could be improved, I would investigate. Now we need to understand why these two buffer headers are so popular. I will investigate the two most popular buffers. But honestly, my focus in this posting is on the second buffer; 4,1552339. To determine the segment's name and type, I'm going to use my dba_extents based OSM script, objfb.sql. The SQL is a little tricky, so you may want to check it out. Let's first look at block 1,117328. Since a row was returned, this popular buffer header is indeed the op_load_params table header block! This is not what I expected and not the focus of this blog posting... so I'll move on. But if this was a production system, you better believe I would figure it out! Now let's turn our attention to the other hot buffer header, namely buffer header 4,1552339. First I'll determine the object type by running my objfb.sql script. Very interesting... an index. So we know this hot buffer header is an index block. I'm willing to bet it's the index's root block! Why? Because every time an index is accessed, it's root block buffer header (and buffer) is also accessed. And a very active index root block buffer header can cause its hash chain to be very active which can cause problems when a process attempts to acquire the hash chain's child latch. But how can we tell if an index block is the root block? As I wrote in my November 11, 2011 posting, we can expect an index's root block to have a block number that is one greater than its segment header block. If you look closely at the SQL below, the block number I entered is one less then the popular block (1552338 = 1552339-1). If this 1552339 block is indeed an index root block, then it's segment header will have a block number of 1552338... let's check it out! Fantastic! A row was returned, which means the popular buffer header is indeed the index's root block! So the initial diagnosis is complete and now we need a solution. A poor solution would be to increase the number of CBC latches. Adding CBC latches does indeed significantly help during a disperse CBC latch acquisition pattern because each latch covers fewer chains. But when there exists a singular CBC acquisition pattern, the additional latches won't help much. What we need to do is somehow make the popular index root block buffer header less popular. One solution is to hash partition the index, which effectively creates multiple root blocks because each partition has a root block. At this point we have our diagnosis and a solution. This is one of my more complicated (and perhaps confusing) posts because to really understand what I'm getting at, you must have a good understanding of Oracle buffer cache internals. Personally, the hot index root block situation is particularly satisfying. It's a very real application of when the top wait event is "latch: cache buffer chains" simply increasing the number of CBC child latches will not significantly improver performance. But with just a couple of extra diagnostic steps, we can nail the core Oracle contention area. It took a while to get there but I hope you enjoyed the ride! Fixed In Oracle Database 12c? 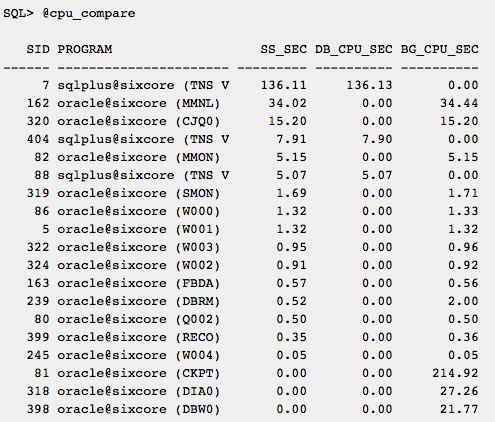 Session CPU Consumption Statistics How To Use The Oracle ASH time_waited column Does Table Column Order Affect SELECT Performance?